We were getting ready for a dinner party but ended up in the emergency room. I was six weeks pregnant and an ultrasound confirmed my fears. There was no heartbeat. This was the first loop of the roller coaster. Two days later, I followed up with my doctor. There was another silent and still ultrasound. There were tears. There were a lot of labs drawn. There was a brief glimmer of hope in the doctor wanting to wait before making a final treatment plan. More loops in the roller coaster. And this is where we were on the day my husband and I were to head out of town on a very rare getaway to see Rend Collective in concert. I packed my overnight bag in a daze. We had been so looking forward to this trip. They are one of our very favorite bands and we’d already bought the tickets. Even though we were emotionally exhausted, we decided to make the best of it. The entire four hour drive was spent waiting on pins and needles for the nurse to call with my lab results. I called her twice with no success. Finally, as we were pulling into the parking lot, the phone rang. The labs were inconclusive. I walked into the concert not knowing if my baby was alive. Hindsight is a precious gift. At the time, I could not wrap my mind or heart around what was happening and the timing of it all. But now I know the lesson God wanted to teach me that night. And His timing provided the best way to learn. The concert was not a show. Not at all. It was a night of worship. And, if I’m honest, I was not in the best emotional place for that. But God is on His throne and the Holy Spirit is not deterred by emotions. The Lord ministered to my heart and I could not help but worship the Creator. My Creator. My baby’s Creator. I knew I had to trust God in His plans. No matter what the outcome might be. There was peace. Such peace. And there was joy. Which seems so improbable. 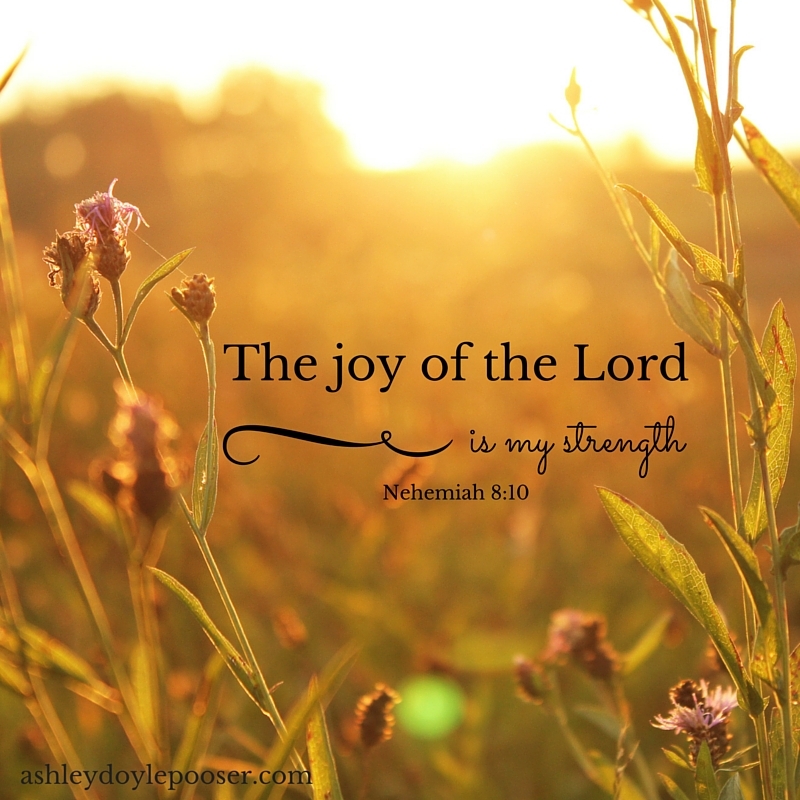 But the joy of the Lord is not situational. God was merciful to us and the following week showed a strong heartbeat and a growing babe. We named her Abigail (“the Father’s joy”) and we’ll be celebrating her first birthday in just ten days. God’s divine timing had us in the right place at the right moment to truly learn about the joy of the Lord. In spite of our emotions, we worshipped with abandon and chose to glorify Him no matter what. We got a chance to deeply experience the peace that passes all understanding. Tomorrow night, we are getting a chance to worship with Rend Collective again and I am so looking forward to it. Our life has been less dramatic lately but still tough. The icky things of daily life pile up one after another and it’s hard to shovel through when you’re not sleeping. I’ve just been so worn. I’ve found that sometimes a strong faith comes easier in the dramatic valleys of life than it does during the long hot trudges through life’s deserts. Thankfully, the joy of the Lord is not based on my spiritual geography. I’m looking forward to celebrating Him tomorrow night. Over Spring Break, I got a chance to sit out on the back porch of my parents’ house. They live in the quiet countryside of north Florida, surrounded by pine forest. All throughout the day, the only noise is ours. Someone puttering in the kitchen. Someone else calling the dogs back in. Laughter and playing and the occasional argument between the kids. But at nighttime, the woods come alive with a loud symphony of sound. Sitting on the back porch, with the frogs and crickets and birds all shouting their songs, God reminded me of something. Each individual creature is tiny and fragile. On its own, it could be overlooked and not noticed. It could be forgotten, easily stepped on or quickly dismissed as insignificant. But together? When they come together to raise their voices? It’s a choir that can be heard for miles. It will not be ignored. Individually, we feel fragile. But together, we are strong. I recently had the privilege of witnessing this firsthand. Jennie Allen, a popular Christian speaker and author, was alone in a hotel room, trying to finish a book and realized her own need for community. With no real expectations, she tossed out a link for a Facebook group. As of this writing, in the week since its birth, “Our Village” currently has 4,983 members. Almost 5,000 people. Mostly women. Who immediately felt the need in their own hearts to connect and jumped in. Hey everyone. I wasn’t going to introduce myself because there are just so many people to know but I thought I might as well go for it. I’m so-and-so from somewhere. I’m a wife/mother/friend/sister/daughter/teacher. I’m glad to be a part of this group because _________. And where that ________ is? Insert any one of five thousand incredible, unique, God-given stories. A story that might not have been told because there are so many stories that have already been shared. And we tend to feel like our voice and our story isn’t as needed or as exciting or as important as the others. But we are made for community. We need to hear each others’ stories. And we need our stories to be heard. God made us that way. For every reluctant introduction, the need to be known finally outweighed the fear of being overlooked. The need to be a part of something bigger than ourselves was stronger than the fear of rejection. But strangers who are now a part of something bigger than themselves. I have seen women jump to congratulate and cheer on successes. I have seen women humble themselves and bravely tell their truths once held hidden. I have seen women shower grace upon grace. And again I’m reminded of the frogs, the crickets, and the birds. Each one a tiny creature. One small part of a much larger whole. But together, we are strong.